I am not crafty. I only pretend to be. I am not an ERAU student. I only pretend to be. You see, my husband attends this school and therefore feel I am entitled to use his popularity to my advantage. These kids, this school? It's amazing. Free newspapers, and software, and water bottles everywhere. It's awesome. I could ask any of the students around me and they would no doubt be able to complete my math project without any trouble. But, as David said, "Anyone who is at the library at 11:30 at night has something to do" which makes me afraid to even ask. So instead, I will work on it myself. It's really hard. Can someone please help me? Or at least feel bad for me? Do you want to see my craft? I sort of don't care if you don't. Because right now I feel like being a Bragging Blogger. Generally, I despise anyone who spends most of their blog posting and talking about the things they have made. Unless that is the point of the blog, in which case i don't even read/know about it. The library is closing in 10 minutes. They will shut me off if I don't hurry. I want you to see my craft! Seriously? I did that. Don't laugh. It really was a lot of work. I busted out my scissors, used my table and glued the edges. Yes I said glue. I have some "liquid needle" stuff. It's AWESOME! If you haven't used or heard of it, you better get some. But don't tell anyone my secret. I'm so cool huh? I like this because it's not only a curtain, but a piece of art. We never open that window because our neighbors house is like 4 feet away. I'm not exaggerating. Well, a little bit I am. But the house is really close. And if we opened it up, they would look in. And I have privacy issues. Oh, and the sun is always shining in that window. No matter the time of day, it's always sunny. 8 more minutes until I can't write anymore. I'm typing super fast now. Wait! The guy over the intercom just said 5 minutes! Aaaaahhhh. I'm not done with my thoughts but I better go. I have a lot more to say but I guess you'll just have to wait until tomorrow. 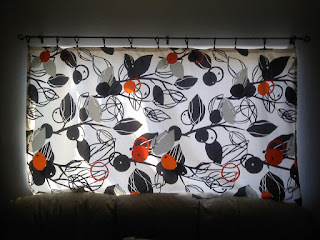 Comment on my curtains. Right now. Well, don't. Because that's not what I'm looking for. But I AM proud!! lol. 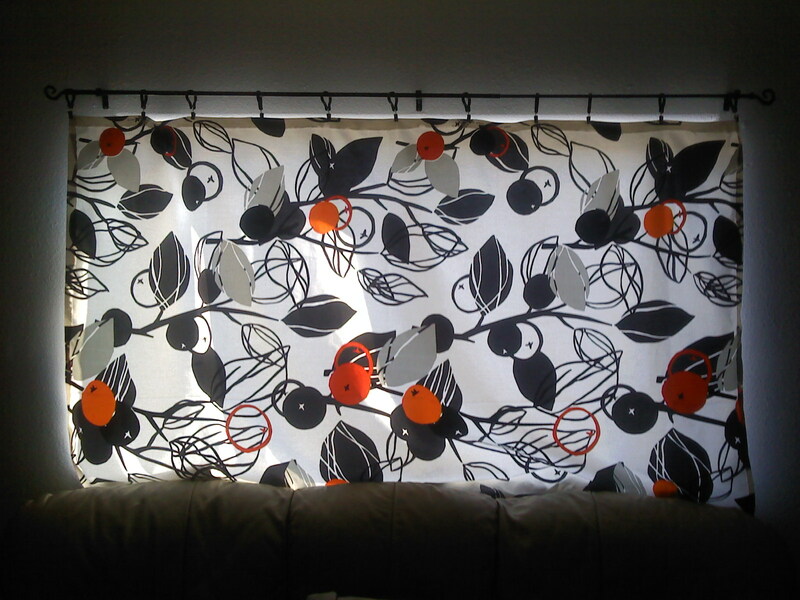 I love the curtain! Now I want to make one! did you just do the ends? or all the cool patterens too? I only wish I did the patterns. Let's pretend I did. lol. No, I got the fabric from Ikea. But thanks for even thinking that was possible!! !